The small city of Chippewa Falls, Wisconsin would be both the birthplace of Seymour Cray and the place that would hold him and give him roots. From the day he was born in 1925, Chippewa Falls was his place. His father, a civil engineer, encouraged his obvious early interest in the technical world, with radio playing a central role in his interests. Seymour’s first taste of the world outside Chippewa Falls came courtesy of the US Army in 1943. Reluctant to enlist, he ended up in the infantry and saw action in both the European and Pacific theaters. The Army found little use for his electrical talents in Europe beyond assigning him to a signals unit and having him tote field radios around Germany, but in the Philipines he was put to work on cryptographic analysis of Japanese codes, which at least harnessed some of his considerable mathematical powers. Big, big iron: the UNIVAC 1103, Cray’s first design. Source: Wikipedia, public domain. With the end of the war, Seymour completed his degree in electrical engineering at the University of Minnesota, and stayed on for a Master’s in applied mathematics. With little idea what to do next, he took a professor’s advice to apply at a place called Engineering Research Associates in St. Paul, Minnesota. ERA was one of the first companies created specifically to build computers. Formed during the war to concentrate on code-breaking gear for the US Navy, the firm was kept afloat by the Navy even when funding for other military contractors dried up after the war. ERA continued to build crypto gear for the military, but started applying their technology to service a new market: commercial digital computers. Their first product, the ERA 1101, came from the Navy’s need for a code-breaking machine that could be quickly reprogrammed. That machine would later become the UNIVAC 1101, after ERA was purchased by the Remington Rand Corporation. Seymour’s first job at ERA was designing the successor to the 1101. The ERA 1103 was a behemoth of vacuum tube technology, weighing in at 19 tons. For RAM it used Williams tubes, CRTs displaying a matrix of dots for each memory location; the presence or absence of electrostatic charge could be sensed with metal plates on the tube’s screen. It was unwieldy but far faster than other RAM technologies of the day, and helped give the 1103 the edge over an IBM machine in a head-to-head test by the Navy to assess machines for weather prediction. With the sale of ERA to Remington Rand and a concentration on machines and processes specifically for business, Seymour saw the writing on the wall. His interests lie in high-performance scientific computing, and so he left ERA to start his own company. Along with William Norris, another ERA alum, he founded Control Data Corporation (CDC) in 1957. The timing was perfect because commercially viable transistors were becoming available in bulk at reasonable prices. Using his favorite design tools – a blank notebook and a #3 pencil – Seymour sat down to create CDC’s first machine. The CDC 1604 was basically the ERA 1103 redesigned with germanium transistors. A 48-bit machine rather than a 36-bit machine like the 1103, the 1604 was tiny compared to its tube-filled cousin – less than a tonne and only the size of two large refrigerators. It was the first transistorized scientific computer, and more than 50 were built. While some private sector companies bought the 1604, the military was its biggest buyer. The US Navy bought the first machine for weather predictions, and the Air Force put redundant pairs of 1604s in Minuteman silos for guidance and aiming calculations for the ballistic missiles. Seymour leveraged the success of the 1604 to the hilt. He set the bar for his next machine very high – a machine 50 times faster than the already speedy 1604. To deliver, he needed freedom from the distractions of upper management and visiting customers, so he insisted on relocating his development team to his hometown of Chippewa Falls. With newer, faster silicon transistors, the CDC 6600, an order of magnitude faster than any other machine on the market, debuted in 1964. The 6000 series would sell over 400 units, and it would remain the world’s fastest computer until Seymour’s next machine, the CDC 7600, which he started designing when he got bored with the almost-completed 6600 design, knocked it off its throne in 1969. 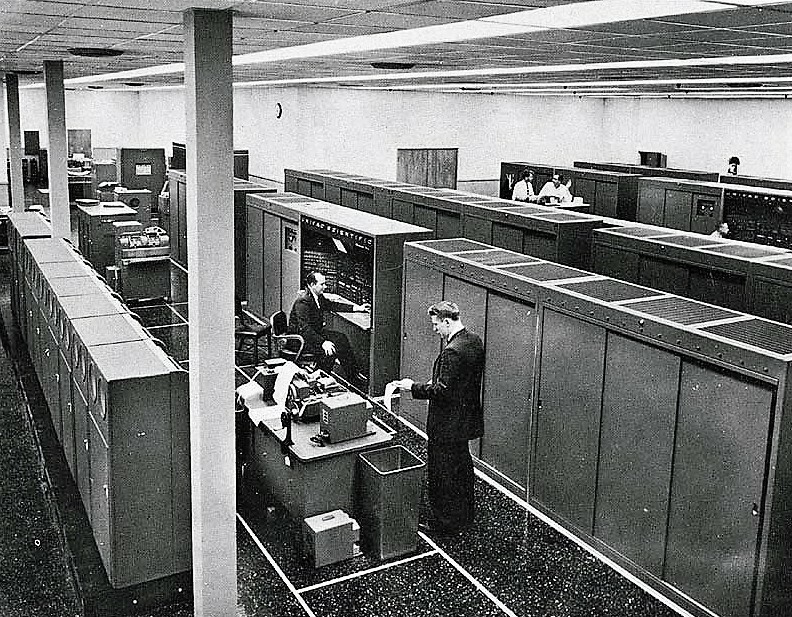 The age of the supercomputer had arrived, and Seymour Cray was at its forefront. 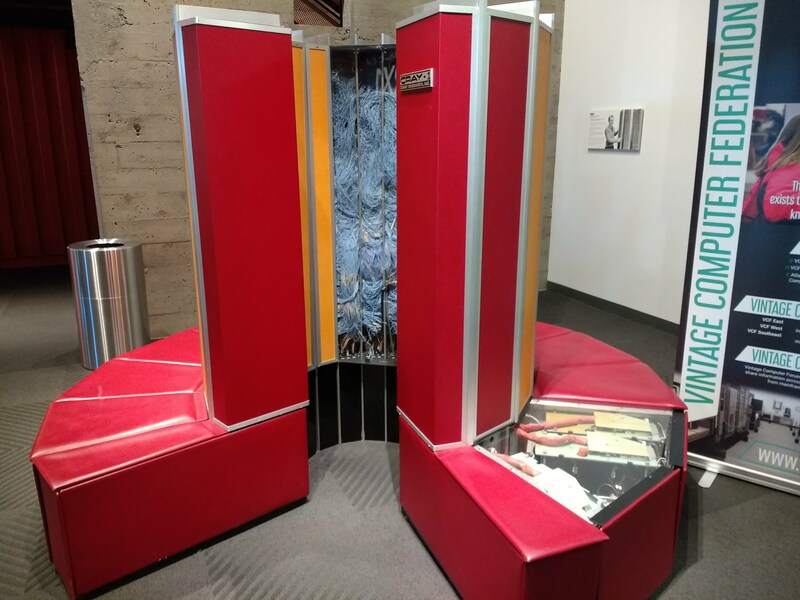 Beauty and brains: the Cray-1 on display at Living Computers: Museum + Labs in Seattle. Time and technology, not to mention the end of the Cold War and its lavish defense budgets, eventually caught up with Cray’s designs. It became more cost effective to throw racks of commodity computers at the kinds of problems supercomputers had been built to solve, and demand for his big machines waned. He resisted the massively parallel approach for years, but eventually relented and set up a new company, SRC Computers, to develop the new designs. Tragically, just as the company was getting started in Colorado Springs in 1996, Seymour’s Jeep was clipped by another car and rolled three times. Seymour was rushed to the hospital but died there three days later. He was 71 years old. It’s sad to think about what the world lost when those designs died with Seymour Cray, and we’ll never know what might have been. But perhaps the amount of scientific knowledge that was generated thanks to the raw computational power Seymour gave the world was bequest enough, and then some. I heard that he had an algorithm for buying his car. 4. Go back to designing computers. 5. He died in a car accident. When I think of iconic computers, I think Cray (1). When I think of iconic air flight, I think Concorde. That the Cray sayed on the ‘fastest’ list for so long is amazing. And it looked so cool as well. And the concorde remains the fastest (commercial, not military) plane ever to fly. Even still. And it too is the coolest looking. True Cray(1) was fastest for along time, but what really gets me in computers is that the PDP11 was in active production from 1970 through to 1990. I think it was Serial No. 3 of the Cray-1 I saw at the National Center for Atmospheric Research (NCAR) in Boulder, Colorado. Maybe it is just a myth, but I heard his only patents were on cooling systems for his computers. Same thing about patents, as far as I know. Not Apple II, but MacIntosh. He used Macs to design the Cray-3. The story I heard was that the aspect ratio for the Cray-3 chips was chosen by what he could fit on the Macs screen. I work right down the road from Cray. ‘s not the same Cray…I think they bought the SGI* name, as well. Though they still design high performance computers, I believe. OK their web page lists some history — SGI bought cray, spun off Cray, bought by Tera, who renamed themselves Cray…so sorta kinda the same company, but with a significant ownership “bobble” in the 90’s 00’s. To complicate matters, there were really two Crays. Cray Research, founded by Seymour to build the Cray-1 (and which produced later machines like the Cray-2, XMP, YMP, C90, T90, and T3E) and Cray Computer Corporation, founded by Seymour after he left Cray Research to work on the Cray-3 and Cray-4 Gallium Arsenide-based machines. Cray Computer Corporation was located in Colorado Springs. In addition, there was a third entity (Cray Labs), a subsidiary of Cray Research, located in Boulder, CO which was pursuing some advanced design concepts for future machines. It was shut down and folded back into the mother ship in the early ’80s. Cray Computer Corporation went bust in 1995. Seymour then went on to found SRC Computers (which still exists but flies very much under the radar) shortly before his untimely death. Cray Research is the company that was bought by SGI and later sold to Tera (which then renamed itself Cray Inc.). I worked for Cray Research from 1981-1989, went to work for Seymour in the Springs, went back to Cray Research when CCC folded, and then quit right before The Occupation (since it was readily apparent what was about to happen and I didn’t want to find myself caught in a mass layoff while moving from Colorado to Minnesota in January ;-) ). I recently left cray after nearly 10 years, and can tell you nothing is farther from the truth. Most of the staff in the Chippewa Falls factory and many in the Bloomington office have been with the company since before the SGI buyout. Tera bought the operations and IP from SGI in 2000, and while SGI essentially shredded any IP for (at the time) legacy products, employees were glad to see the end to what I’ve heard called the “dark days”. However the company culture and experience remains, and it’s not uncommon to talk with staff that had worked alongside Seymour. Part of this is the company has low attrition, and it’s an in-joke to tell anyone leaving “you’ll be back” as rehires are common. The rest is a “moonshot” sense of pride seeing a machine that you help bring up get in the top 10 of the TOP500 list, get a mention in the news as being used to find a cure for a disease, or give advanced warning for a deadly hurricane. Also it never gets old running the commands on the SMW to spin up megawatts of computer, especially being in the same room to hear it gradually go from quiet to deafening. Few people truly have hands-on experience with the oddball problems that come with scaling system management over tens of thousands of nodes, or cooling and power delivery at that scale, or logistics of delivering and installing hundreds of cabinets of compute, storage, and networking to a customer site. But assuredly the experts in those areas are all at Cray. He was looking for software last time I looked at the page. I can’t talk to that other than to emphasize the word “shredded” in my previous post and that some kind folks have done everything in their power to help. About 10 years ago, I worked with a gentleman that worked on the Cray-1. His picture is still hanging in the museum in Chippewa Falls. Now I’m working right down the road, and our custodian used to be on the R&D team. The Chippewa Falls Museum of Industry and Technology is amazing. Someone from HaD should do a piece on it if they happen to be passing through, as unlikely as that might be. [ajlitt] I could supply pictures if someone wants to do a write-up. [kruug] HaD does take the occasional “free lance” article. I have learned something — thank you for that post. It’s sad to hear that all the history was shredded, but nice to know that the company, and the people with all that unique engineering talent, survived. The joke I heard from the CDC guys (see below), was that the first three machines of any new design went to: Los Alamos, Ft. Meade, and the Weather Service. It’s quite a heritage. My first experience with a Cray was in college — we got a second-hand CDC Cyber 74. The CPU was four bays, arranged in a cross and the center area was just a jungle of twisted pairs. Had CDC techs onsite with Tektronix scopes to swap the cordwood modules when they failed. I had the option of taking my assembly language course on PDP-11s or the Cyber (because part of the “deal” when we got the Cyber, was a year of apps engineer support — so the school made him an adjunct professor for two semesters). There was only one section of Cyber assembly, and I managed to get in. It was a hoot having hardware floating point and learning all the esoteric tricks of programming that 60 bit monster. All of which I have forgotten at this point! 6600 serial 3 didn’t go to NSA, LANL (LASL at the time), or the weather service. It went to NASA’s Langley Research Center in Hampton, Virginia. It was still on the floor when I went to work there in 1978. ;-) If you want to learn (in great detail) about how the 6600 was designed I’d recommend you read “The Design of a Computer: the CDC 6600” by Jerry Thornton (foreword by Seymour Cray). It’s long out of print, but available on-line at: http://ygdes.com/CDC/DesignOfAComputer_CDC6600.pdf. I believe serial 1 went to LASL. Since the very existence of NSA was still classified then (its existence was not made public until the Church Committee hearings in 1975), I believe serial 2 was officially purchased by “The Maryland Transportation District” (an agency which I believe does not exist). Thornton was later largely responsible for the design of the CDC Star systems – among the first vector processors. The Star was an interesting machine (we had one at Langley), but it couldn’t compete with the Cray-1. Correction – serial 2 went to Livermore. Serial 3 went to NASA Langley. It’s possible that the machines that went to NSA were unnumbered. People did stuff like that back in the 60s. Operated a CDC 6400 for many years. It came in 2 processing speeds. There was a single switch that changed the speed. You couldn’t just flip the switch because there were service techs onsite 8 hours a day and on standby other hours. It was water cooled. The original Cray designs didn’t have parity checks on the memory. He is quoted as saying, “Parity is for farmer’s”. But later machines did have parity. As I recall the 6400 had a 60 bit word with 4 parity bits for “1 bit correct and 2 bit detection” of errors. The was a behemoth of a disk drive used for swapping storage, i.e virtual memory today. It was about 8 ft tall, 4 ft wide, and 10 ft long. There were two disks on each end with multiple platters.The heads were on arms that moved synchronously in and out on both disks. If the arms hadn’t been synchronized the box would have walked across the floor. As it was it shook quite a bit as the heads moved. 4b of redundancy isn’t enough to correct a bad bit. I believe you’d need 8 bits of redundancy for secded. No, the 6000 series had no parity at all. Parity was added in the 7600 and SECDED error correction in the Cyber 170 series. The very first Cray-1 (serial 1, lent to Los Alamos for evaluation) had parity. NCAR (which bought the first Cray-1 actually sold) required error correcting memory, so serial 2 was scrapped and serial 3 (the NCAR machine) was redesigned with error correction. That’s why serial 1 (which still occasionally shows up on the floor at Supercomputing conferences) is shorter than all the other Cray-1s (fewer modules in each column). I clicked the “report” link on the above post by accident – please ignore. Is it just me, or does Seymour Cray look like Harvey Milk? But was his death truly due to an “accident”, or was it something more sinister ….. ? Nothing more mysterious than a reckless moron clipping a car which then hit Crays. Sadly, the man with a brilliant mind died of massive head injuries. I still remember the news. Not funny to those of us who knew him and worked for him. He got clipped by some idiot in a hurry to get to the airport. It was an absolutely catastrophic loss. Seymour Cray is also indirectly responsible for the modern Internet. Without the Cray supercomputers there would have been no NSF supercomputer centres and no NSFNet. NSFNet (and the decisions made in running it) was what lead to the commercial internet we know today. Blue Waters here at NCSA is Cray. If you ever get a chance to physically inspect a Cray1, (like, say at the Computer History Museum) I strongly suggest you do so. It’s really amazing how *physical* the machine is, in the sense of form following function. The logic boards are made with only two or three types of very simple ECL chips, so each board implements at best a medium-sized function. Thus, there are hundreds of individual boards, filled with power (and cooling) hungry chips. The boards themselves are truncated wedges, on a heat plate, filling the racks horizontally. The pointy end contains all the IO, gathered there to keep it closest to the rest of the boards, while the huge DC power rails form some of the “rackmount” structure on either side. Giant, almost unregulated, DC supplies fill the “seats” around the outside to keep them close and minimize the IR drop from those thousands of amps of 5.2 volt DC being distributed. It’s really amazing engineering, from a packaging space, but I wouldn’t want to be one of the people that had to make all the interconnections inside the core. I can only guess how long it took to hook everything back up whenever one of these things was moved. It’s also apparent that the designers kind of knew they were building themselves into a dead-end corner. By the late 80’s everyone was well aware that MOS technology was going to eclipse ECL within a few years and offer opportunities for high–density computing that could only be dreamed of, but… well, that was in a few years, and we need this thing NOW, and in 10 years it’ll be obsolete and we’ll worry about that when it happens. In computer terms it sort of feels like the perfect steam locomotive. > I can only guess how long it took to hook everything back up whenever one of these things was moved. First, the matrix is divided into sections. Say each card has 20 connectors, then you have 9 sections, each of which becomes its own wiring harness. Harness A connects to all the outputs of card 1, and then to just the first input connector of cards 2 through 10. Harness B connects to all of card 2’s outputs, and just the second input connector of all the others. Something like that. The specific layout will vary, but by cleverly allocating signals to connectors, the whole mass of wiring can be segmented up. For the “large matrix” configuration of the machine I’m thinking of, which spanned 4 network racks, the matrix wiring shipped in two boxes each the size of a small coffin. Giant swooping bundles of micro-coax, I believe there were 8,000 shielded conductors (32,000 pins, therefore) split among 6 sub-harnesses. The bundles were as thick as your arm, but floppy because there was no overall jacket, just individual conductors loosely bundled. Once the racks were mounted and ready, the wiring itself would take less than a day to install, and depending on whether the fates were feeling fickle, another day or two to commission and replace however many conductors had failed. Bad ones were depopulated from the connector and taped back, abandoned-in-place within the harness, and new ones gently slipped into the bundles and routed through the shielding ductwork. Every single wire in the whole mess was the same length, so it was easy to carry spares, but routing and storing the slack could be quite the art! Screwing the ductwork covers on and watching the final test come back clean, no pinched conductors, no marginal failures, was always cause for celebration. And it meant the rest of commissioning activities, which required the network complex to be operational, could get under-way. If those computers were made with similar techniques, I’m sure moving one took a few weeks all-told, but the core wiring was likely only a few days of that. There was only one type of logic IC in a Cray-1 CPU: a high speed ECL 5/4 AND/NAND gate (originally supplied by Fairchild). A second IC type (a slower 5/4 AND/NAND gate) was used in the memory for address fanout. When the Cray-1 debuted in 1976 (to say nothing of when design started in 1972), there was no way that MOS could have approached the speed of ECL. When it did, Cray introduced the Cray 1/M ;-) I should note that Cray-1 SN3 ran production at NCAR until 1988. 12 years is a very long useful life for a supercomputer. The 4 central columns (8 “chassis” in Cray parlance) of the machine comprise the cpu, I/O channels, and registers. Memory is on the outer 8 columns(16 chassis, one bank per chassis), but wired so that access time is completely uniform across the machine. Seymour built the fastest machines he could with the technology available. I think he always figured he’d build something faster when the semiconductor industry gave him the components to do it with. When the semiconductor industry couldn’t do that anymore, he started building his own (the GaAs circuits in the Cray-3 and Cray-4). The machine was wired at the factory by hand. We did have an issue with SN 29-34 which required completely rewiring those machines on-site. We flew the wiring crews out from Chippewa Falls to customer sites to do the rebuild. It was pretty amazing to watch them do it (at the time, I was the site analyst for SN30, the first machine to exhibit the issue). Anyway, to move the machine you didn’t do anything to the internal wiring – you pulled the modules, moved the empty machine, and reinstalled the modules. The aluminum columns also provided cooling – there was freon flowing through copper tubing embedded in the aluminum. They drew heat from the modules through that center copper cooling plate. IIRC, embedding the copper tubing in the aluminum columns without leaving any air gaps was a major challenge in the design and prototyping phase of the machine (before my time). Later machines (Cray-2, Cray-3, and Cray-4) were cooled by direct immersion. It’s pretty amusing to see the rest of the industry “discover” this technology so long after Seymour first implemented it. Here is a very good article describing how “Red Storm” (HPC platform commissioned by Sandia National Labs) essentially saved the company from oblivion. Thanks, I enjoyed the article! I worked at a company started by 48 folks who were laid off from Cray building a Cray class supercomputer. It’s fascinating technology at every single layer, physical, mechanical, electrical, electronic, silicon, packaging, integration, diagnostics, OS, and applications. I spent 3 hours in a meeting making a decision about the length of the wires in the back plane. The change would have made the instruction cycle 3ps longer, but the back plane (which was a mat of twisted pair wires) would be repairable vs a replacement. Replacing it took 3 days. Repair took less than 1. Three days of downtime was $X. Wire mat cost $Y. 3ps cycle time added up to Z hours more compute over a year of CPU time. Then factor in politics and workload priority (nuclear simulation, real time crypto, aircraft fleet reshuffling, automotive crash simulation, Whole aircraft finite element analysis, molecular modeling of pharmaceuticals) and it got to be a long discussion. The frame of the machine was titanium. The connectors (2 of them) on the back of each CPU/memory/IO brick had 8,000 pins and had to be pressed in/out with a small hydraulic jack. Each integrated circuit had 4 nozzles directing liquid coolant at it. Silicon die were mounted on both sides of ceramic substrate. Substrates were mounted to teflon circuit boards. Each of the 800 power supplies had 2 or 3 connectors for the power output. Silver plated, 1″ in diameter. The scheduler in the OS had to decide if it was faster to schedule a process in a node that was local but not going to be available for a while, or a node that was ‘far away’ but available now. Very very cool. Titanium frame? Seems to be too large machine for an airplane and I can’t understand why something on a ship or stationary would need a titanium frame, was there any specific reason for this? A truly inspirational man. He has fascinated me since childhood. I remember reading long ago how he designed one of the Cray computers in a paper factory (or warehouse? my memory is pretty terrible), sitting in the corner, mostly alone. It was mentioned how the giant rolls of paper sat there croaking beside him, ominously. The Cray-1 is iconic. It epitomized Semour Cray’s drive to create the fastest possible computer with the technology of the time, without regard to the cost of building or running it. Although 44 years have passed, a decent desktop is now mind-bogglingly 200 times faster, has 1000 times the RAM, uses less than 1/100th as much energy, and costs 1/10000th as much. Watching the nanoseconds-per-cycle as the generations of machines came up on screen was just staggering. A thousandfold speedup in a decade? Wow. And the interview is just fascinating, brief though it is. Thank you for another piece to a remarkable story. I remember when Compaq bought Cray. I really thought that was the tail wagging the dog and kinda sad at the time. Compaq didn’t buy Cray. SGI did (an event referred to by Crayons as “The Occupation”). Compaq bought DEC, which actually worked out well til HP bought Compaq. SGI bought Cray and let it rot. They certainly did. As Ed McCracken (then CEO of SGI) said during his first post-buyout visit to Cray, “As far as I’m concerned, Cray is just a trademark.” Great for morale – glad I was gone by then. They turned Cray Research from a $900 million/year company (1994 revenues) to a $30 million/year company (estimated) in a matter of months (although the disaster that was the T90 didn’t help much). They sold the company to Tera for a bit over $30 million and lent them the money to buy it (with a little urging from certain government agencies).